To back up my comments about paid apps being dead, Ben Thompson writes about Adobe’s business model switch. (If you missed it, all Adobe products will forever more be subscription only.) 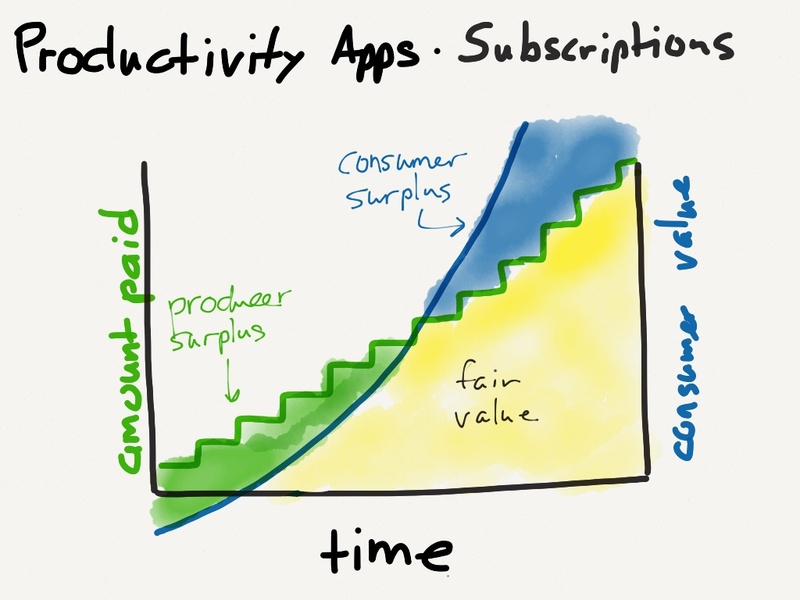 His point is that the economic surplus of productivity apps makes them far more valuable then the prices charged so a switch to subscription makes a ton of sense (for all productivity apps, not just Adobe). The challenge here — and I think this is a huge challenge for Adobe — is that I’m not certain the traditional software apps can make this transition. Take Quickbooks for example. $20 per month gets you access and store your data with Intuit, and that price doesn’t even include everything the Windows version does for $100. Does Intuit make more? Sure, but it leaves me feeling bitter that Intuit is trying to extract $480 worth of value for what used to cost me $100. My general feeling: over my dead body. I have a hard time believing that my customers would accept paying even $20 per year for powerOne, even if it was available on all platforms and the web, synced templates and more. powerOne is designed as a “buy one time” product, like almost all productivity apps of yesteryear. It’s not my customer’s fault that that product is now priced too low to support my company. That’s app store dynamics at work. Re-thinking the product to go along with the model change is imperative. If you aren’t reading this guy, you should be. Amazingly good writer and thinker. Haven’t been this blown away since Horace Dediu at Asymco appeared on the scene four years ago. Most people I know only upgrade every couple of years. In fact I know I’d lose most of them. We asked about advanced features for even $5 per year and had very few takers. This entry was posted in Mobile/Smartphone, Success Factors, Technology (General). Bookmark the permalink. FWIW, paid apps on Firefox OS, that don’t make substantial use of device services like the Contacts Db (and thus installable only from an app store) or have an online component, will be unprofitable, because it’s EASIER to install a bootleg copy (click a button on a bootleg website) than buy from an app store. Since artificial dependencies on a server are straightforward to remove, apps on FFOS will be like the web in that regard, too: subscription is the way to profitability. Not that I like any of this – if software runs mostly on my machine, “pay once for a license” seems much more fair to me. Subscription doesn’t work for all apps. The products really need to be re-thought.